Camere da letto: 1, bagni: 1, ospiti 2. We first visited four years ago, and fell in love with the terrace and view. It is as lovely now as it was then. It is quite a climb from the town, but you can take the bus. If visiting in cold weather - the living/eating area is small, but the terrace is a joy. Paola the owner is delightful. Excellent service and advice from Summer In Italy, everything worked well. We really liked Casa Chicca. At first we thought we were a bit far from the hot-spots of the Amalfi Coast but then, after a few days, we loved that we were in this smaller village among more of the locals and not so many tourists! It became our home away from home! We were welcomed with a bowl of fruit and a few necessary items in the fridge. Everything was lovely. We booked on the recommendation of friends who stayed there a few years ago. I felt everything was great. I spent a wonderful month in Casa Chicca and once I had worked out where I was and how transport worked found it very easy to get around. The steps will not be for everyone but it helped me keep fit while I enjoyed the local food. It is not in the busiest part of Praiano but nothing is too far. I enjoyed coming back to Casa Chicca especially after a hectic day in Amalfi or Positano. Casa Chicca was immaculate! not an overly large living space but I didn't plan to be there much. The terrace was very sunny and with a lemon tree providing shade. I've had a great experience with Summer In Italy. I came across the web site accidently but will certainly use it again if planning another Italian stay. Having local knowledge of areas was invaluable for me as I was travelling to places I'd never been. Their photos and comments of the property were spot on. They were able to help me decide if I needed a car for the area or what the climate is often like etc etc. We loved our time at Casa Chicca. It is small but the location, the view, the terrace with barbeque, ensured that we had a truly peaceful and relaxed holiday. The kitchen is small but well equipped. We generally ate out at lunchtimes and returned to Casa Chicca for the evening meal on the BBQ - delicious fish or meat bought at the village shops. Delivery of ordered supplies of general foodstuffs and drink to the door from Angela Alimentari's excellent shop, was also a huge plus no having to carry heavy wine and water bottles up the hill!! Paola the owner was charming and had put together a helpful guide to Casa Chicca including bus timetables, garbage collection times and several cultural suggestions for whilst we were there. There is an extensive selection of guides, maps and suggested restaurants on the bookshelf in the bedroom. 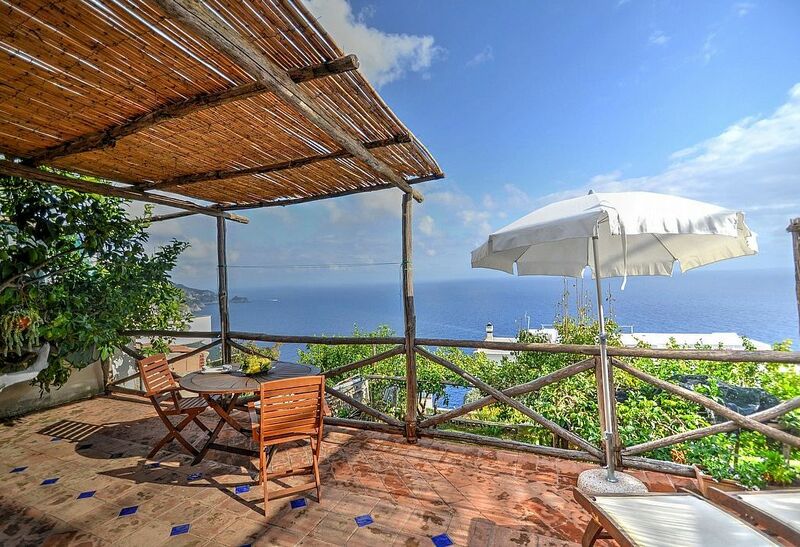 We fully expect to return to the Amalfi Coast, and would hope to stay again at Casa Chicca. My wife and I stayed for a week at Casa Chicca. It was a delightful experience, one we'll never forget. The kitchen allows you to prepare meals at home, especially nice for breakfast when you can enjoy morning coffee on the terrace. It's nice to have the use of a washing machine so you can pack lighter. We came to Praiano and the Amalfi Coast expecting to walk hills and steps and weren't disappointed. The scenery and views from the terrace and surrounding areas was very impressive, stunning actually. We planned our trip wanting to avoid the tour groups and stay with "the locals" and we were able to do this at Casa Chicca. The pictures and description are spot on. We would be glad to return here. Thanks for all your advice and travel suggestions for us. We had a wonderful honeymoon at Casa Chicca. The terrace was superb, the washing machine was modern. Paola [the owner]was charming and helpful. Many thanks, we had a lovely holiday and Casa Chicca was lovely. Praiano was beautiful and we would be happy to return. Summer In Italy was so helpful and supportive, we really looked forward to and enjoyed our holiday. We have recommended you to several people!! Il prezzo include: elettricità; biancheria da letto; biancheria da bagno. Da pagarsi in loco:pulizia finale EUR 50.00.